Cheese heaven ... or hell? Three-quarters of the way through dinner at Baud et Millet in Bordeaux the tops of my cheeks strangely started tingling. I told Nicole, only half joking, that this had ceased to be fun. All you can eat cheese. Something to try. Once! At the start. When all you can eat cheese is fun. This night of gluttony started after Nicole read on The Points Guy's website about a Bordeaux restaurant with a cheese cellar in the basement and an all you can eat option. The young women in the story gleefully high-fived as they tucked into their cheese selections for the night. Sounded like a great time. And for those (like Nicole) not bent on squeezing every bit of value out of their meal, I'm sure this does make for a pleasant night. But having paid €32, I was determined to eat all of the cheese I could. And I did. And it wasn't easy. And it wasn't always fun. But I did it. Nicole enjoying her cheese in a more sensible manner. To be sure, Nicole and I would recommend this restaurant to anyone. Once you sign up for the all you can eat cheese option, the waiter walks you downstairs to a cheese cave. It's not huge, but it's packed, packed, packed with all sorts of cheese. 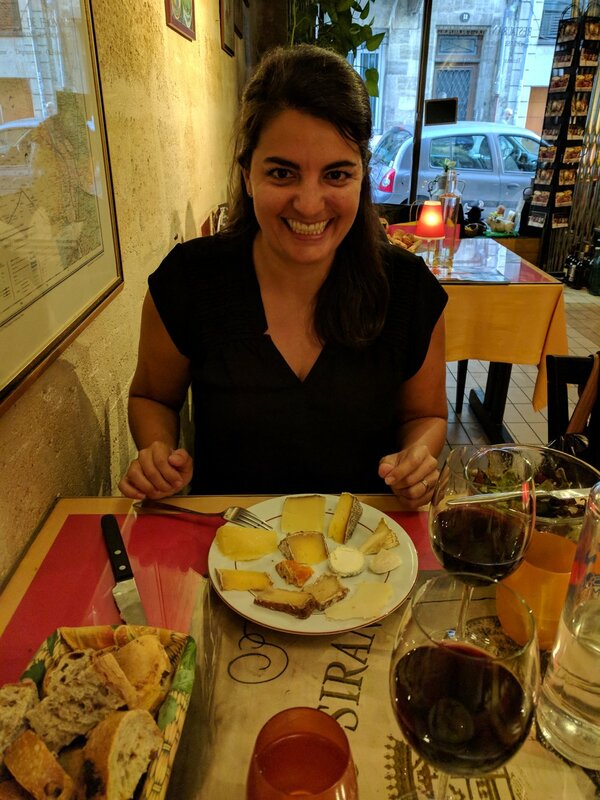 The waiter hands you each a knife and plate, along with instructions to take small portions so as to be able to try as many cheeses as you can, then leaves. Alone in the cheese cellar, Nicole and I looked at each other like ... seriously? ... then we started filling our plates. Back upstairs at the table, the restaurant does include a bread basket and a small salad to accompany the cheese (and wine can be purchased), but, other than that, we just ate cheese. Lots of it. Once we finished our first plates, our waiter encouraged us to trek back downstairs for another plate. He kept telling us it was a "cheese party." Did I mention that this restaurant served cheese? For me, it was all fun and games until midway through the second plate. Then the cheese hits you. Man shall not live by cheese alone.... Nicole quit with some cheese remaining on her plate. I'm too small town to take someone's cheese and then not eat it. So I pressed on. As mentioned above, my cheeks started doing funny things and my body hurt. But I made it. I ate the cheese. If you haven't spotted the trend, this is a picture of cheese. Nicole makes it all look fun.